Behind the Ride: Creative Process for "Diamond" Routine - Music, Costume, Choreography, and More! Creating a competition freestyle is a lot of work but creating an exhibition freestyle is an entirely different challenge. I wanted to share my thought process behind our new routine to help give insight to other riders that want to create their own exhibition freestyle. There really is no particular way to put one together but my process might help spark some ideas for you. Originally I was planning to perform with my friend Lydia Spencer dancing as we have done in the past. Unfortunately her schedule wasn't working out so I was left with two weeks to put together a new routine. At first I was disapointed but then I was excited at the thought of creating something new. The day of the performance was Douwe's 14th birthday so I wanted to dedicate the routine to our partnership together. I have considered him to be a "diamond in the rough" because of his background and thought diamonds would be a fitting theme. Click here to read Douwe's story. This was perhaps the most frustrating piece of the process. I went through at least 5 edits of the music and spent at least 7 hours finding music online, downloading, editing, burning test cds and watching the music to videos of my horse. I love picking music but it was stressful for me because I was still editing music the day before the performance. I started with songs that I knew the audience would recognize, Diamonds by Rihanna, Chandelier by Sia and Lay Me Down by Sam Smith. I found acoustic piano versions of all three and practiced riding to them every day. It was tricky to edit them smoothly and I wasn't feeling the flow for the liberty work. I ended up purchasing some music from AudioJungle.net that was more dramatic with clear highs and lows. It wasn't long enough for my entire routine so I blended that with the Diamond song. Two days before the performance I practiced our routine to the music and found it wasn't inspiring me for the liberty work. Back to AudioJungle I went and found a romantic, inspiring song by the same composer that was easy to edit. However, I didn't want to lose my Diamond theme so I took the very beginning of Rihanna's song to set the tone for our routine. Trying to choreograph a liberty routine can be considered very difficult or very easy depending on how you look at it. On the one hand I really can't have detailed choreography because I have no clue what we will end up doing at each moment on show day. All I can do is have specific markers in the music so I know when I would like to take off the bridle, dismount of the liberty work or perform specific movements. On the flip side it is extremely challenging because I need to have 1-2 backup moves in the back of my mind in case Douwe isn't at the right position of the arena, in the right balance or in the right mood for that particular movement. During the winter months I have been playing with new moves, having Douwe pick up the veil with his mouth, trot and canter beside me with the veil, follow me with veil, etc. Trying to blend these different movements together and make it look like a finished routine requires that I stay super focused and in the moment with my horse. The most important thing to remember is that the audience doesn't know what you are trying to do so just smile, even if you make a mistake!!! The audience wants to be entertained and if you looked frustrated it takes all the passion out of the performance. Performing exhibition routines has helped me overcome some show anxiety because I am forced to stay present in the moment, if I get tense or lose focus my horse will just leave me! Putting together a costume is always fun...for this routine I didn't have the luxury of buying anything new because of the time crunch. 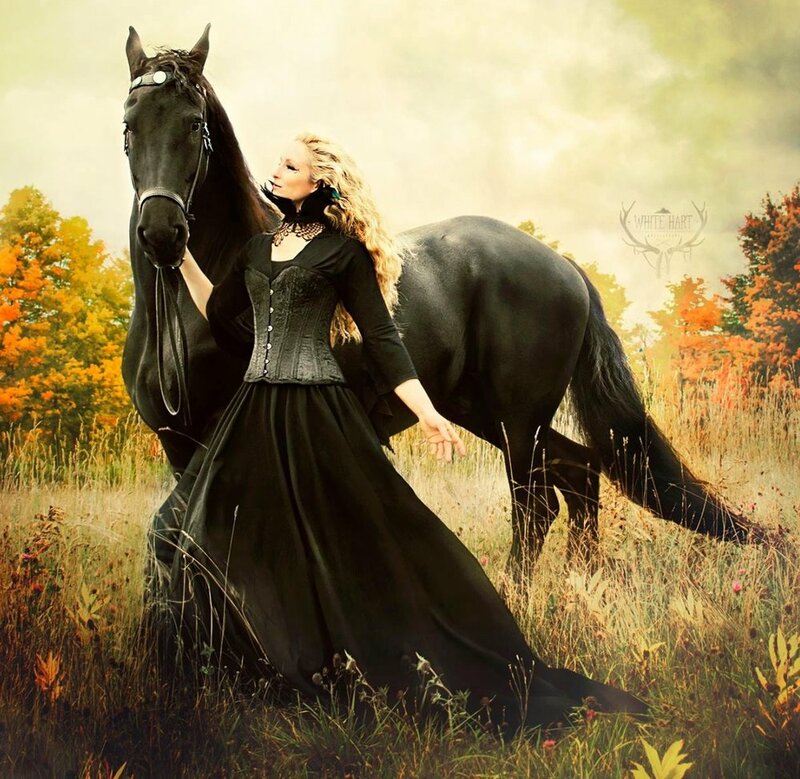 I went through my collection of dance and riding costumes and came up with the black petal skirt from Moondancebellydance.com, my Art on Horseback corset from www.corset-story.com, and a wrap top I use for dancing. I did buy sequin trim and fabric from Jo-Ann Fabric to add to my corset, saddle pad, petal skirt and to use as a veil. My costume jewelry was a throw back to my days in the Isaac Royal Equestrian Theater in a Moulin Rouge routine I used to ride in. I used spray glitter to cover paint specks on my corset and on my plain black breeches. I added my diamond browband to Douwe's bitless bridle and we were ready to go! I braided my hair the night before so that it would be wavy and I braided some sequin fabric into the front to keep it out of my face. Elisha Harvey helped me glitter Douwe's hooves, mane, tail, pretty much all over! For more details on how I get the glitter to stick check out my blog post on DIY Glitter Hooves, Mane and Tail. I painted a diamond on Douwe's forehead and swirls on his neck and hind end using a special trick we figured out years ago.....fabric paint! The fabric paint stays wet long enough for you to create the design and add the glitter. It takes about 30 minutes to dry and you have to be careful not to touch it or have your horse rub it off before it is done. Once it is fully dry it will stay on for days! If you have any questions or comments please leave them down below or email me at beginthedance@gmail.com. I would love to hear your stories about performing or any ideas you might have about the creative process. Have fun dancing with your horse! Friesian Horse BRIDLELESS and at LIBERTY, Shining Bright Like a DIAMOND! We're beautiful like diamonds in the sky." This routine was performed at Safe Haven Farm in Durham, ME in 2015. They have an annual open house that I have performed at many times. This year was special because it was Douwe's birthday on the day of the show. He turned 14 and I wanted to honor the 6 years we have had together. I consider him my "diamond in the rough" so I decided to go all-out with glitter and sparkle! We did a bridleless and liberty routine, performing new liberty moves we have been working on. It will take time to perfect performing together, but I am having a blast thinking of creative new ways to dance with my horse. Please share this video if your horse shines bright like a diamond. Enjoy!